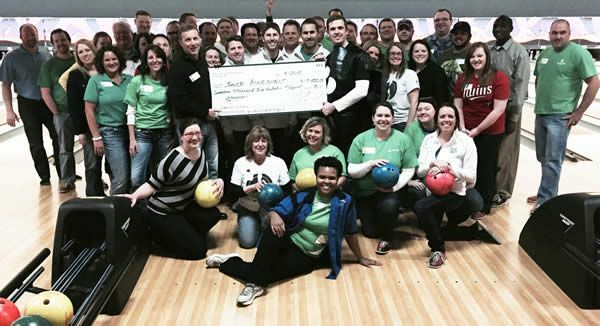 About 50 Associated colleagues recently took to the lanes for another successful JA bigBowl fundraiser to support Junior Achievement (JA) of the Upper Midwest. This is the sixth consecutive year Associated and JA have partnered to conduct the fundraising event, which took place across the Twin Cities and at other JA regional locations. In 2014, Associated colleagues provided nearly 5,000 hours of volunteer community service in Minnesota, including over 50 hours to Junior Achievement. This year, Associated is working with JA organizations to implement a focused financial education initiative across Minnesota, Wisconsin and Illinois. Photo caption: Pat Richard, Associated Regional Sales Manager, presents a $17,500 check to Ryan Stauff, JA Vice President of Corporate Development (in bowling ball costume). They are surrounded by approximately 50 Associated colleagues who participated in the bigBowl event and raised $7,500 of the total.